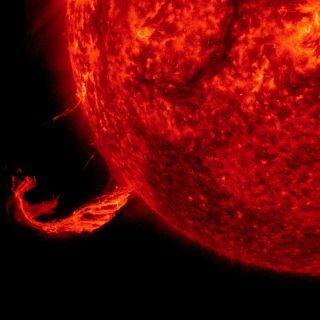 The sun blasted out a coronal mass ejection (CME), along with part of a solar filament, over a 3-hour period on Feb. 24, 2015. On Thursday (Oct. 29), the White House released two documents that together lay out the nation's official plan for mitigating the negative impacts of solar flares and other types of "space weather," which have the potential to wreak havoc on power grids and other key infrastructure here on Earth. "The efforts undertaken to achieve the objectives of this strategy will establish a national approach to the security and resilience in the face of our improved understanding of the seriousness of the space-weather risk, and the steps we must take to prepare for it," Suzanne Spaulding, undersecretary for the U.S. Department of Homeland Security's National Protection and Programs Directorate, said Thursday during an event hosted by the White House Office of Science and Technology Policy (OSTP) that discussed the new documents. That risk is indeed serious, many experts say. High-energy solar flares aimed at Earth can affect the operation of orbiting satellites, and the most powerful emissions can even pose a risk to astronauts aboard the International Space Station. Of even larger concern are coronal mass ejections (CMEs), huge eruptions that send clouds of solar plasma streaking through space at millions of miles per hour. CMEs that hit Earth can spawn intense geomagnetic storms, with the potential to disrupt power grids, satellite navigation and radio communications temporarily. In March 1989, for example, a strong CME caused a blackout that left 6 million people in the Canadian province of Quebec without power for 9 hours, OSTP Director John Holdren said during Thursday's event, which was webcast live. An even more powerful CME slammed into Earth in 1859, generating beautiful auroral displays as far south as the Caribbean and causing the failure of telegraph systems in both Europe and North America. If a geomagnetic storm as strong as that one — which is known as the Carrington Event — were to strike today in our much more technologically advanced society, it would likely cause $600 billion to $2.6 trillion worth of damage in the United States alone, according to a recent study.